There are various options to choose from while taking a Bhutan tour from Kathmandu, Nepal. The trip begins from Kathmandu where you will take a flight to Bhutan. And as you land at the Bhutan Airport, you will head on with exploring the beautiful kingdom. Bhutan often revered as the Land of Thunder Dragon is one of the last Shangri Las in the Himalayan region. With its remoteness, spectacular mountain terrain, varied flora, and fauna. And its ancient prestigious Buddhist monasteries, Bhutan is a unique and a beautiful country. Traveling to Bhutan is definitely worth the experience in which the country has something special to offer at any time you choose to visit. Well, you can definitely travel to Bhutan from your respective home country. But if you want Bhutan tour from Kathmandu after exploring Kathmandu, we can help you with that. How to Enter Bhutan from Kathmandu? When is The Best Time to Take the Bhutan Tour? How to Get Visa for Bhutan? It is the day one where you will take a scenic flight to Paro. Upon reaching you will meet your guide and driver there. You will then have a pre-trip briefing, on arrival, at the hotel. Later in the afternoon or evening, you can spend your leisure time in Paro. Today you will spend the day in and around Paro. You will visit the ruined fortress of Drukgyel Dzong (fortress-monastery). In the early 17th century, during the invasion by Tibet, this fort defended the Paro valley. Over the dzong, you can see the towering Mt. Chomolhari on a clear day. Further, as you explore the beautiful valley of Paro, you will see the watchtower, locally known as Ta-Dzong. Also, you will visit the national museum of Bhutan. You will then take a short walk downhill to the Rinpung Dzong which is the administrative center and school for monks. Further, you will proceed with a little walk and cross the traditional bridge into Paro Town. Today you will explore the capital of Bhutan i.e Thimphu. And, visit the Indigenous hospital where they still practice the traditional healing arts. Also, you will visit the Art and craft school, the National Library, the royal goldsmith workshop. And the Handicraft Emporium with its famous weaving, wood carvings, and paintings. In the afternoon, you will pay a visit to the Memorial Chorten dedicated to the late King Jigme Dorji Wangchuk, the founder of modern-day Bhutan. You will also visit the 15th-century Changangkha monastery. Also, Motithang mini zoo where you will see the rare “takin” ( the national animal of Bhutan). After all these, you will drive out of town for a view of the Thimphu valley. Later, you’ll visit the new Drubthob nunnery temple and stroll around the local market. This is the fourth day where you will drive for about 3 hours to Wangdue Phodrang locally known as Wangdi. You will pass via Punakha where the climatic zones change from mountainous to tropical. On way, you will cross over Dochula at 3150m. Dochula is a high pass with prayer flags and a Chorten and views of the eastern Himalaya including the highest mountain in Bhutan, Mt. Ghangkar Puensum, 7520m. Further, you will drive through forests of rhododendron and magnolia. The road then descends into the warmer lowlands around Punakha. Here you will visit the Punakha Dzong which once was the old capital of Bhutan. This remarkable fortress built in 1637 lies between two rivers and has survived glacial floods and fire in the past. There is a procession known as the Punakha Serda every February to commemorate the victory over the Tibetans. Overnight at Wangdi Kyichu Resort. Today will be an excursion to the Gangtey Gompa valley at 2800m. Gangtey Gompa is a Buddhist complex which includes monks quarters, a meditation center, schools, and a small hotel. All these overlook the Phobjikha valley. It is a designated conservation area which borders Black Mountain, National Park. This gompa is one of the most isolated ones in Bhutan where there are no telephones nor electricity in order to protect wildlife. This beautiful valley is home to the rare Black-necked cranes which migrate from the Tibetan plateau to escape the harsh winter. About 200 to 300 cranes live in this valley. And the Royal Society for Protection of Nature takes every measure to ensure their wellbeing and protection. They do it by not allowing the locals to make loud noises. Or fish in the river that runs into the valley during the 4 to 5 months that the cranes are in the residence over winter. Furthermore, you will explore the fascinating glacier-carved valley. You return to Wangdi for the night. Today you will drive back to Paro which is equally amazing. You will cross the spectacular Dochula once again and arrive at Paro in the afternoon. Today is another amazing day where you will witness the Taktsang Monastery. First, you will drive to the foot of the monastery. The famous Tiger’s Nest monastery has been one of the divine resting places of the Guru Rinpoche. This place is of huge religious importance and was once destroyed by the fire but it’s restored. As you walk along the trail, you will get to see the monasteries’ breathtaking location on a cliff edge about 800m above the valley floor. After the amazing excursion to Taktsang Monastery, the remaining day is your free time. Overnight in Paro. It is the day eighth and is already the time to bid goodbye to the beautiful land of Bhutan. 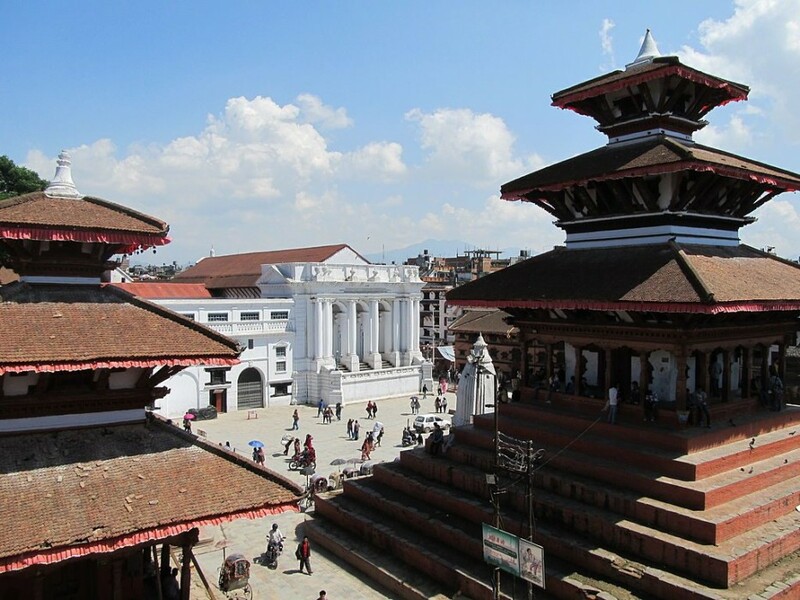 As you share your farewells to your driver and guide, you will take a flight back to Kathmandu. From Kathmandu, you can get to Bhutan only by Bhutanese Airlines. Bhutan has only one international airport at Paro which is some distance from the capital of Thimphu. The airport is one of the toughest landings in the world, dropping fast from the mountains and landing on a short runway. Only expert pilots have the permit to fly this route. Currently, Bhutan airlines have only three flights per week which normally run on Tuesday, Thursday, and Saturday. However, this can increase to as many as five flights per week during the peak weeks for tourism in Bhutan. Druk Air operates flights daily from Kathmandu to Paro. Yet, there is only one flight per day each way. Flight time varies depending on the season. And all flights to Bhutan from Nepal take around 1 hour 15 minutes. Prices are pretty reasonable. The lowest ticket cost starts at around USD 200. Bhutan is an all year round destination for tourists. However, there are high and low seasons. So, before you book the Bhutan tour, it is important to have an idea on the weather and temperature of the place. And, choose and plan the trip accordingly. Autumn: September, October, and November is autumn in Bhutan. This is one of the busiest seasons for tourism in Bhutan. During this time, the weather conditions and temperatures are mild and have less rain. These months are great for all kinds of tours and treks and are also popular festival months. Spring: March, April, and May falls under spring season and is the 2nd most busy season in Bhutan. Spring is popular for lush green forests, fields, and landscapes. Also, it seems the blossoming of local flowers make the country vibrant and beautiful. Moreover, the pleasant temperatures add to the beauty of tours and trek to Bhutan in Spring. Summer: June, July, and August are the local summer season in Bhutan. During this time Bhutan experiences rainfall which may not be ideal for trekking as it can be muddy and slippery. Yet those who want a little bit of adventure to their trip and are on a tight budget can opt for this season. This is also the time when there is less crowd. However, the positive side is you can catch rainbows amidst the mountains. And get a view of the beautiful landscape during this time. Winter: December to February, is the winter season which is another low season in Bhutan after summer. It is the coldest time of the year in Bhutan. The temperatures in the mountains drop down below freezing levels. Yet, for those who don’t mind the cold, traveling in winter isn’t that bad. You can enjoy clear skies, witness snow-capped mountains, and amazing landscape. In the lower regions, the days are pleasant and sunny. The morning and nights, however, can be a little cold. Getting a visa for Bhutan is not as simple as for other countries. Unlike other countries, Bhutan doesn’t have many embassies around the world. So, the only way to get a visa is to book a trip to Bhutan through a registered tour operator. Once you book your tour and pay for it, the tour operator will make an application on your behalf. With a copy of your passport, itinerary and booking details, the tour operator applies for the visa. Upon approval, the tour operator along with the two Bhutanese airlines, Druk Air and Bhutan Airlines will receive an approval letter. You will then receive a letter by email from your tour operator which is your invitation to visit the country. You will need this letter of approval for your flight, as the two airlines will not accept bookings from tourists that do not have an approval letter. Once you reach Paro Airport, Bhutan, all you need to do is provide your passport and approval letter to the immigration officials. They will then issue your visa and allow you to enter the kingdom. Your tour package will normally take care of your accommodation and dining in Bhutan. The standard accommodation provided for the Minimum Daily Fee (MDF) is a three-star hotel or guesthouse. However, you can upgrade this if you wish to but that means your Daily Fee will go above the minimum and the tour will cost you more. Breakfast and dinner are normally included in the Hotel and lunch is also part of the package. Though your guide will advise you on which restaurants you can eat in the area. You have the option of eating lunch in the hotel if you are within the area at lunchtime. Yet, if you want to eat elsewhere from your guide’s advice, then it may cost you a little more. This, you will have to pay at the time of the meal. Also, if you want to dine out for dinner, it is at your own expense. You are free to roam around on your own within the city you are in. However, you are not allowed from one city to another. There are several checkpoints where you need to verify your visa and travel permits. ATM and cards are not completely reliable. Moreover, it is not widely used in Bhutan. Hence make sure you have enough local cash to cover your expense during your stay. While clicking pictures of Dzong, Monasteries, and stupas, make sure you ask your guide if you can take photos. As some of them have strict restrictions on photographs. During the peak season like Spring and Autumn, make sure to book your trip in advance. During the trip do not forget to try the local Bhutanese dishes. Some of the popular ones like Ema Datse, Dumplings, Hogay, Nosha paa. Also, you can try the local butter tea. Depending on what you are looking for while traveling to Bhutan, there are various packages that you can take from Kathmandu. There are options for various festival tour packages and trekking tour packages etc. One of the packages we have is Druk Path trek from Kathmandu. You can personalize the itineraries and packages that best suits your requirements and needs. Hence to customize the itinerary and for any queries about Bhutan tour packages, please feel free to contact us.